CODE Live Opens February 4th! -- 18 days of interactive art and cutting edge music. 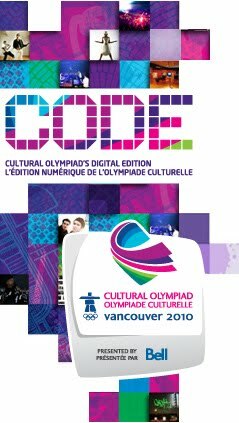 All part of CODE, the Cultural Olympiad’s digital edition. Looking for a way to get engaged with Contemporary Art? Check out CODE Live, the Cultural Olympiad's digital edition — an 18-day, multi-venue event featuring contemporary art exhibitions that use technology to give audiences a one-of-a-kind perspective. Open during school hours, the exhibitions are free and accessible by public transit. Located at three main venues — Great Northern Way Campus, Granville Island, and the downtown branch of the Vancouver Public Library — you'll be invited to interact with digital works and become part of the creative experience. Come experiment with virtual acoustic plants that respond to touch by emitting sound. Play a live game with participants in Montreal through a digital touchscreen. Interact with models wearing shape-shifting garments that transform based on the wearer's movements. Or try on a vest that allows you to reshape large-scale projections of emblematic buildings all over the world. CODE Live runs from February 4th to 21st. For hours, locations, and detailed information about all the works exhibited, visit the CODE Live website.